If you've been in a bathroom in a public place recently you may have noticed something missing from the restrooms of the past. That's right, the forces that be have conspired to take away our paper towels. Instead, w e get those blower machines. This is one area where technology has not improved our lives. The two or three second hand drying process with a classic piece of brown paper towel has been replaced by a tedious 30-second session of holding one's hands under a stream of semi-hot air. When the machine shuts itself off one will usually find that his hands are not dry and will have to either push the button and wait again, or resort to drying them on his pants. This is done so that movie theater, restaurant, gym, and other business owners can save a few bucks on paper towels while hopefully nobody notices. Shameful! 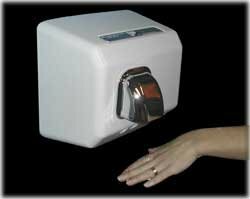 A positive advance are those new paper towel dispensers with motion detectors so you don't have to touch them. More of those!